The fencing around the site of the Gogama train derailment is coming down today, as the clean-up from the oil spill has been declared complete. But residents say their local waters are still contaminated with oil. Sheens of oil are commonly seen on the Makami River, over which the oil train derailed in March 2015, as well as lake Minisinakwa, on which the town is built. People have also found several dead fish in recent weeks and wondered if it’s connected to the spill. Benson said CN rail is willing to continue the clean-up, but has been told by the Ministry of Environment that the work is satisfactory. 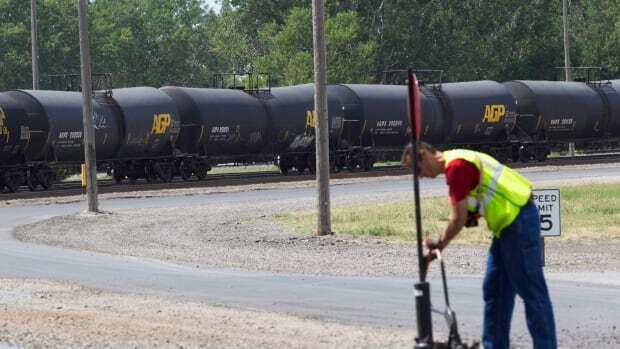 CN has agreed to let more soil samples be taken from the site and be sent away for independent testing, along with some of the dead fish, at the company’s expense. Benson said he was surprised to find out over the last year and a half that the railroad was responsible for the environment testing, not the Ministry of the Environment. “I can’t believe our government tells the fox to test the chickens,” Benson told a public meeting of over 100 people at the Gogama Community Centre, which ministry officials were invited to attend. Benson said Ministry of Environment officials are aware of the oil slicks in the water, but don’t seem concerned. “We were going down the lake and we saw oil and he said ‘Well, just because there’s oil doesn’t mean it’s necessarily dangerous,” he said. Ministry officials may not have been at the meeting on Tuesday night, but they were in Gogama the following day to take water samples on Lake Minisinakwa. The ministry statement also said that further fish testing in the Gogama area is planned for the fall, but reiterated that the fish tested last fall showed no signs of contamination. CN officials had planned to attend the meeting, but were called away at the last minute. After expressing their frustrations for over an hour, the crowd erupted in applause, when Chad Boissoneau suggested that one way to get attention would be to “shut down” the railroad with a protest. He is a band councillor in the nearby Mattagami First Nation and has headed up efforts to keep up in the pickerel population in area lakes. “The clean-up shouldn’t be determined by what MOE feels is satisfactory, the clean-up should be determined by the community members and what’s satisfactory to them. Because we’re the ones that have to live here,” says Boissoneau, adding that oil has yet to be sighted in the waters by the first nation, which is downstream from the spill. Several people from Timmins, which draws its drinking water from the Mattagami River downstream from the spill, also attended the meeting and there was mention of how these waters run all the way to the James Bay Coast. Towards the end of the meeting there was talk of circulating a petition that Nickel Belt MPP France Gelinas could table at Queen’s Park and including these downstream communities. Gelinas said until now people in Gogama were always hesitant to draw too much attention to the oil spill, fearing it would hurt the local tourism industry. But many lodges are reporting a drop in business anyway. “There was always this reluctance to talk about it too much outside of Gogama,” she says. Gelinas said she too has had trouble getting government officials to give time to the concerns of a small town called Gogama. “If this environmental disaster had happened closer to Toronto, things would have been handled very differently,” she said at the meeting. Train derailment and tanker fire by Heimdal, ND, 2015-05-06. Pic courtesy of Jennifer Willis.